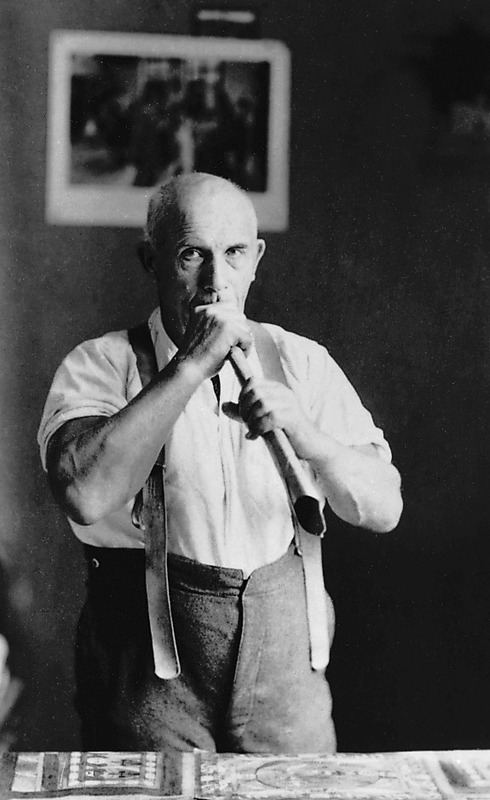 A former farm labourer and handy-man, Wölfli was schizophrenic and spent much of his life in the Waldau Clinic, a Swiss mental institution outside Bern. In 1921, his psychiatrist, Walter Morgenthaler, wrote a study of his work, introducing him to the art world. 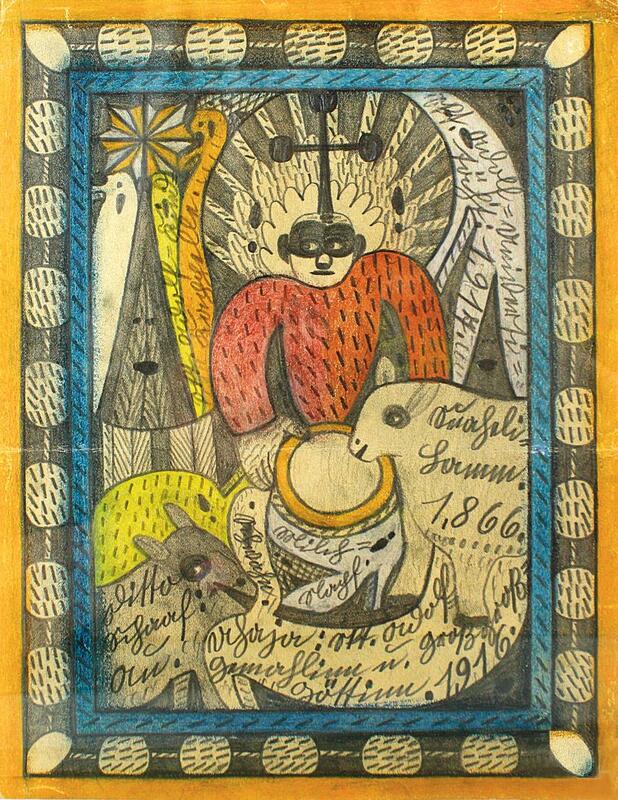 Adolf Wölfli became known as the quintessential outsider artist. His childhood was scarred by family loss and brutality, near-bonded labour and illness. He was eventually incarcerated for sexual assaults on girls and was sometimes a violent patient. 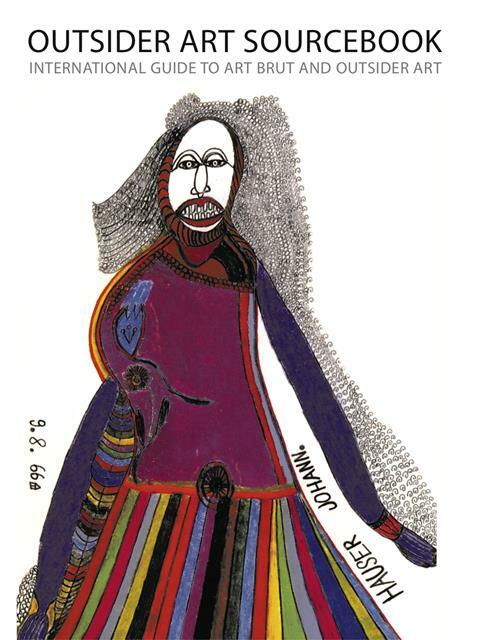 Drawing enabled him to handle and calm his outbursts, and to channel his intense obsessions and hallucinations. Wölfli’s densely detailed drawings contain a matrix of elements, including buildings, “bird” motifs, bands, text and his distinctive round faces, all crowded into the picture plane and framed with decorative borders. The compositions appear intense, organic and flowing. Wölfli also used musical notation in his art, which he would play on a “trumpet” made of rolled-up cardboard. In 1908, he embarked on an epic illustrated story, which grew to 45 volumes, made up of 1,600 drawings, 1,500 collages and over 25,000 pages. This epic included accounts of his wealth and world travels with his entourage in the guise of “St Adolf”. 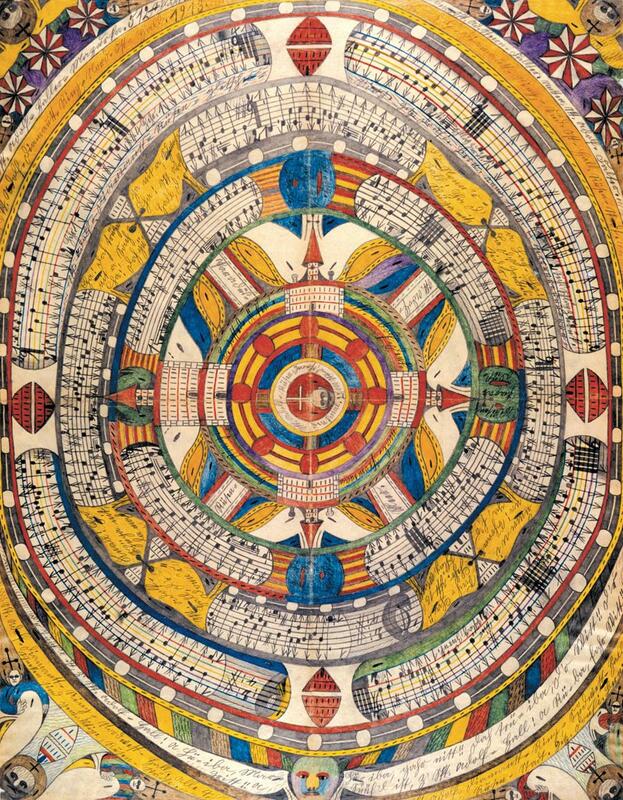 Adolf Wölfli is one of the 250 artists and environmental builders featured in our new and improved Outsider Art Sourcebook, available to purchase here.